Natural beauty connects us to the environment and promotes healthy living. Good design increases property values and lowers energy costs. Sustainable landscapes help preserve the natural environment. Places to gather, celebrate, mourn, and relax connect family, friends, and commuinity. Don't turn over your property to just anyone. Growing your vision requires creativity, diligence, and a sound methodology. Landscape planning and design is more than just fancy drawings and pretty portfolio pictures—it is about solving problems. Quality landscape design requires a professional. Great places don't just happen, they are designed. Read more on how landscsape architecture adds value. 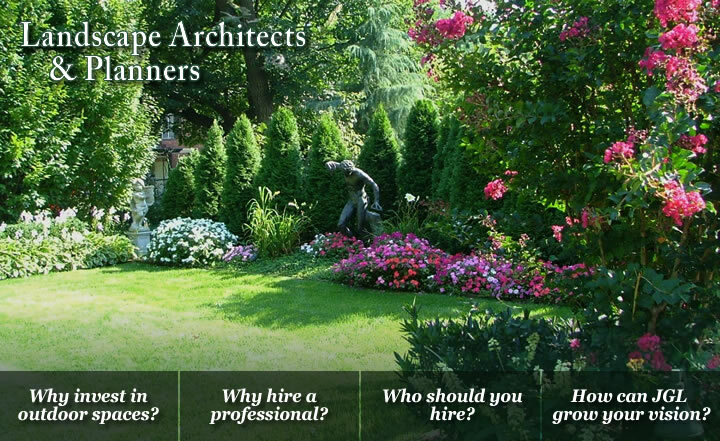 Find a landscape architect that fits your values and works well with you. Before you engage them, remember you are building a relationship that can grow your vision. Discover their design philosophy, credentials, and experience. JGL Design may be the right fit. Learn more about JGL and our team. JGL Design provides professional land planning, analysis, design, and project management services. Whether you are building a new home, looking to spruce things up in the yard, or just need some assistance for a do-it-yourself project, we can help create the outdoor space that suits your life. At JGL Design, we add value to your life and your investment. For more information, see our services.